My Baked Keema Samosa, an Indian-style meat pie, is vegan and meatless, of course, but it’s just as delicious as the real thing. And with just 60 calories in each samosa, you can afford to indulge. 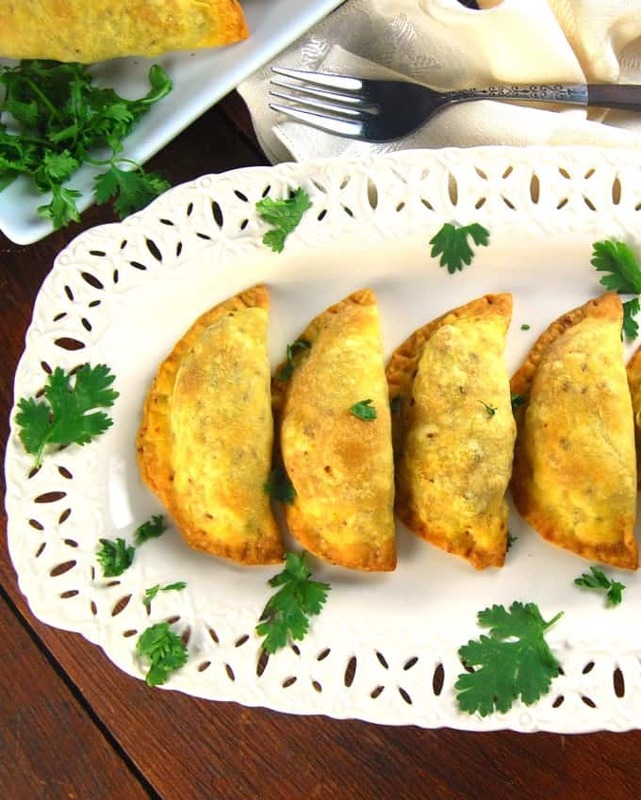 Serve these samosas as a snack or even as a lunchbox meal. A nut-free recipe. 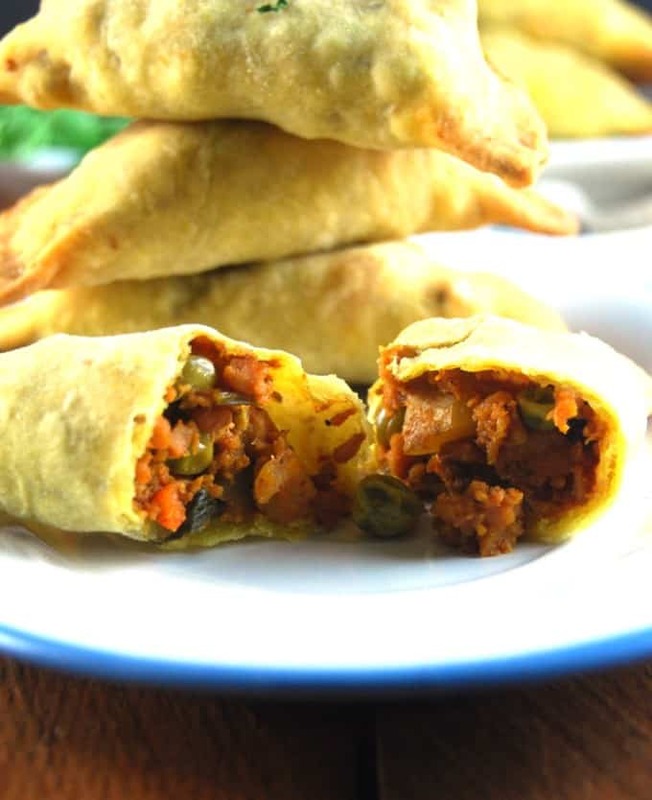 These vegan and meatless Keema Samosas are not just crispy and savory and all of those other good things that make the tastebuds scream, gimme more! They’re also comforting and soul-satisfying and kid- and adult-pleasing. There’s hardly anyone in the world today who does not know a samosa, or love one. 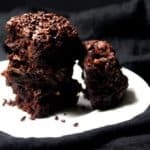 It’s the perfect snack, crunchy on the outside with a delicious filling on the inside. 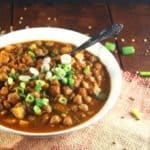 While the traditional samosa filling is potatoes, it is easy enough to switch that out for something healthier, like chickpeas, one of my favorite samosa stuffings, or even lentils. 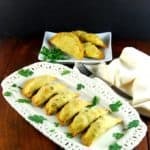 This time, given that it is the holy Muslim month of Ramadan, I decided to make a samosa that’s particularly popular among India’s Muslims: Keema Samosa. 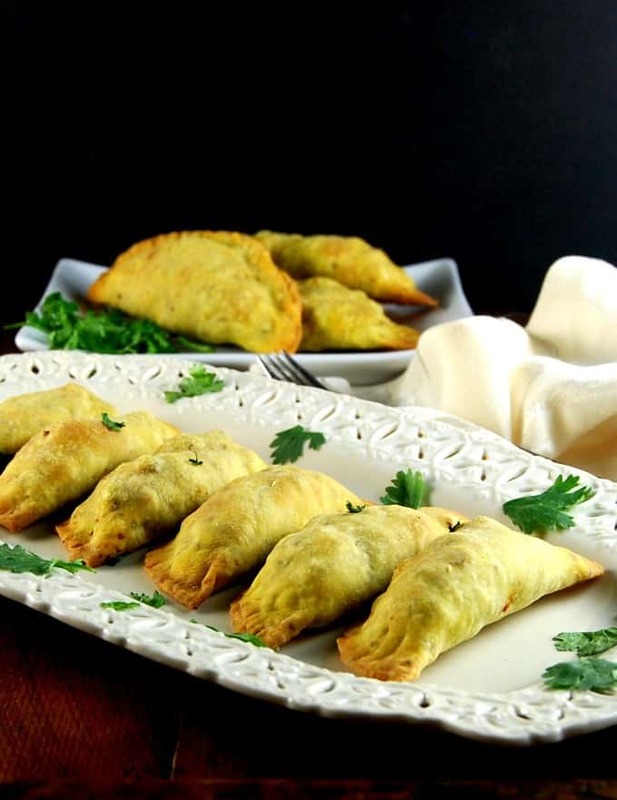 Keema is ground meat– usually mutton or beef in India — and restaurants in Bombay sell mountains of these samosas to the devout for iftar, the feasting that goes on after the Ramadan fast each night. In my home, we need no excuse for samosas, especially when they are baked, like these are. The keema for my keema samosa, of course, is absolutely vegan, made with textured vegetable protein (TVP). But it’s so flavorful that not even the most die-hard omnivore will complain. In fact, when I take my vegan keema to potlucks, it’s usually the first thing that runs out. And stuffed inside the crispy samosa cover, it’s absolutely divine. The TVP makes these samosas protein rich, but there are also a ton of veggies in here– carrots, peas, and onions. 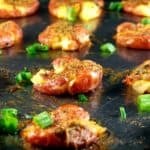 You can experiment with others– sweet potatoes or mushrooms would be perfect. It’s late Saturday night so I’m gonna run and curl up with a glass of wine, these Keema Samosas, and Desi. Perfect. How are you spending your weekend? My Baked Keema Samosa, an Indian-style meat pie, is vegan and meatless, of course, but it's just as delicious as the real thing. 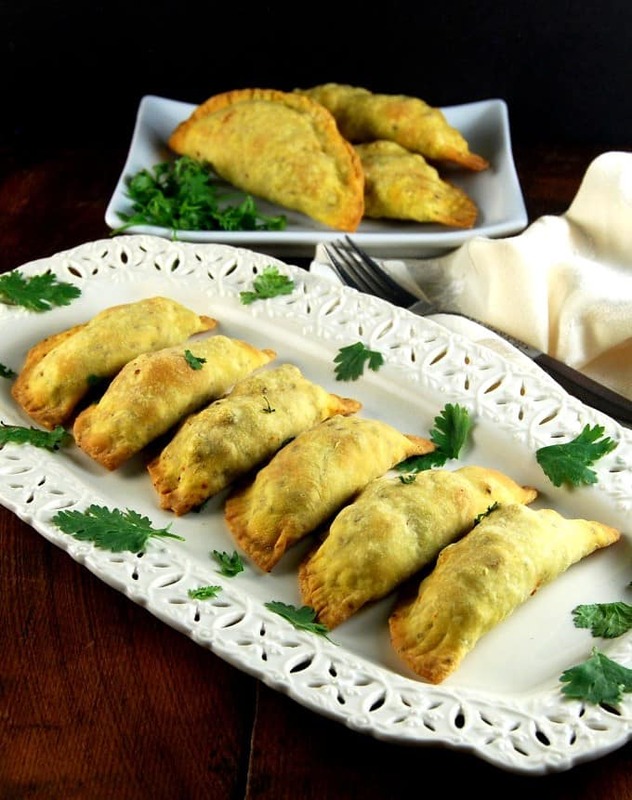 Serve these samosas as a snack or even as a lunchbox meal. A nut-free recipe. Mix all the ingredients except the water in a large bowl. Trickle in the water and mix into a stiff but smooth dough. Set aside in an air-tight tin for at least half an hour. Heat the oil. Add the onions and saute until brown spots appear. Add the ginger garlic paste and stir-fry for 30 seconds. Add the tomato ketchup, mix, add the garam masala, coriander and cumin powders, soy sauce, turmeric, paprika, and cayenne, if using. Stir well to mix. Add the carrots and potatoes and stir to mix. Saute for a couple of minutes. Add the TVP. Mix well, then cover and let the filling cook until all the water has dried up. Once the TVP starts sticking slightly to the bottom, you will be done. Add the green peas and let them warm through until tender. Add salt if needed, coriander leaves, and lemon juice. Mix well and turn off the heat. There should be no visible moisture in the filling. 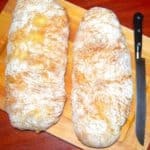 Divide the dough into 24 pieces. If you want bigger samosas, you can just make fewer pieces. It won't change the baking time. Or do as I did and make a few big ones and a few small ones. Roll each piece of dough into a smooth ball. Then roll it out, using enough flour, into a very thin circle, about three to four inches in diameter. Moisten the edges of each circle. Place a heaping tablespoon of filling in the center of each of the circles, then fold over to form a half-moon shape. Press down on the edges to seal. The dough will stretch a bit and help you along, but don't tear it. 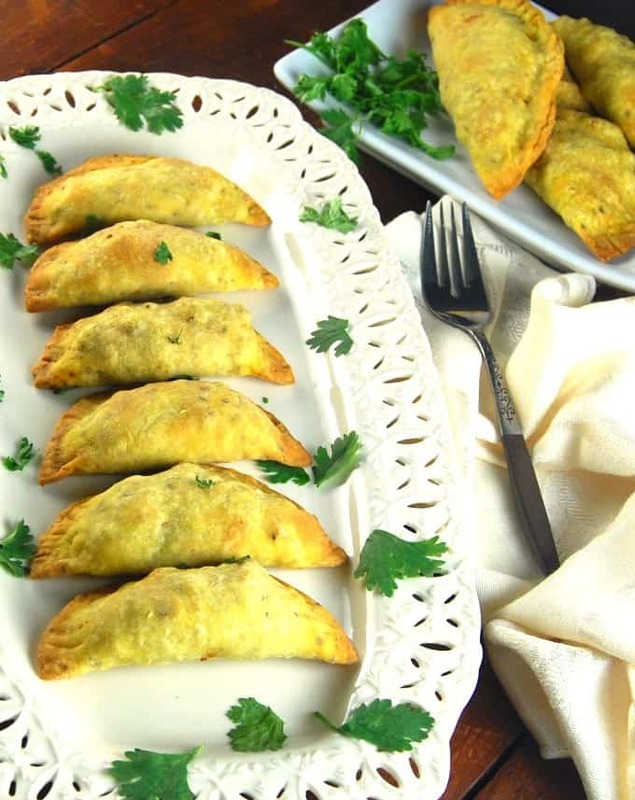 You can also shape these in the traditional samosa shape by following instructions here. Press down on the edges with a fork to seal it tight. Place the samosas on baking sheets sprayed with oil. Spray or brush some oil on the top of the samosas which will help them crisp up and also give them a nice color. 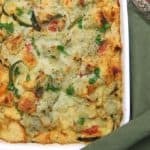 Bake in a 350-degree preheated oven for 45 minutes or until the edges are lightly brown and crispy. Let stand on a rack for five minutes, then serve hot with chutney, like thisdate-tamarind chutney. Phirni, a delicious pudding made with powdered rice, almonds, and rose water. Just divine. Mirch ka Salan, a creamy, nutty pepper gravy served with a luxurious, puffy naan. Thank you for helping me be a true blue Vegan.I feel healthier and my doctor is very pleased with my cholesterol. Hi Geetha, TVP is textured vegetable protein or soy protein. We used to find it in India as soy granules? Hope you will try them! I do have soy granules.Thank you,Vaishali.Belated Happy Father’s day to Desi!! You had me at baked. I love samosas and so does my son. Thank you! Do you have a good alternative for ajwain seeds? I can’t find them even at Whole Foods! Hi Marcus, use cumin seeds– grind them coarsely before adding because they are bigger and that will make the dough easier to roll. It’s not the exact flavor as ajwain, but will do at a pinch. I love your Vegan adaptations . Went out for Indian food yesterday . The food was good but limited Vegan choices. I wish I was eating you dishes. 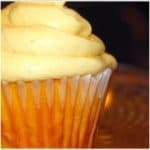 Will have to make theses . Thank you. 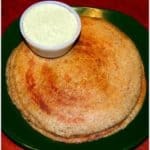 can we use whole wheat flour instead of APF? Hi S, you can, but you won’t get a very crisp cover which is half the fun. The whole wheat cover will be softer and a little more robust-tasting. I would advise sticking with the all-purpose if possible because the dough is rolled so thin, there’s really very little dough in each samosa. Great recipe, Vaishali! I was forced to get up halfway through dinner to start a second batch of dough. Needless to say, we all went to bed with bellies full of samosas, my kids had samosas again for breakfast, and my five-year-old had samosas yet again for lunch. Too bad I can’t post a pic in the comments 🙁 Anyway, thanks again! Good eats for sure! I just made these. LOVE them! Rarely do I cook or bake with dough so I was a bit terrified but I conquered my fear and did it. Delicious. I will definitely make these again. 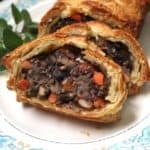 Also would consider using a vegan pre-made puff pastry dough for a quicker prep time. Question….approximately how much water do you end up adding to the flour to make the dough. I think I added too much and had to add more flour after realizing. I made these tonight. Delicious. I found, however, that there wasn’t nearly enough dough (even though mine were paper thin). I’d double the recipe in the future. I did use puff pastry for the remainder, and that worked well too. Filling was v tasty. Made these tasted very good but had to make a second batch of dough as so much filling left over, next time I will make dough with two cups of flour. 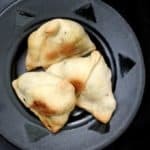 These samosas turned out perfectly, and everyone loves them. They are delicious. Thank you so much for all your wonderful recipes.